If you’re looking to move house in the Watford area you’ll be well aware that the process is fraught with stress, from the day you put your own home on the market to the day you land in the new property, there are many obstacles and hurdles to overcome. One of these hurdles is the removals process: Getting your possessions from A to B with the least possible fuss. Here at TH Removals we offer house removals with a difference – we’ll work with you to ensure that the process is completed promptly, properly and of course in the most cost effective manner possible. We pride ourselves on our great rates – how many other removal companies in Watford strive to offer the best service and the lowest rates? Not many! 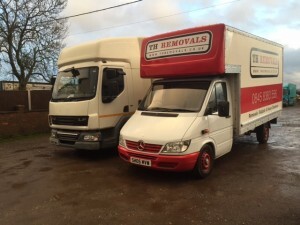 TH Removals was established back in the year 2000 – since we started out our business has grown markedly and we now have a team of hard working employees. The time we’ve been in business has been a huge learning curve – the experience we’ve picked up along the way has allowed us to improve what we do, meaning that you get a better service when you hire us for your house removals in the Watford area. As well as covering house removals in Watford, we’re one of a few companies that cover the most of Hertfordshire, Bedfordshire and Buckinghamshire – that’s a very large area! We do work with many clients who are moving just a few miles down the road – but we also work with clients moving from one end of the country to the other as well. All of the vans in our fleet are fully serviced and insured. We carry an all risk removal insurance policy – this means your property is covered for up to £15,000 when in transit with us (on a per load basis). We’ve also got public liability cover of up to £1 million. Here at TH Removals we like to think that we do things properly. So what are you waiting for? Pick up the phone today if you’re tired of hunting through removal companies in Watford. We’re certain that you’ll struggle to find a house removals company that offers a service as good as the one that we provide. Let us help you through the stressful episode of moving home – call us right away. Or why not get a online quote ? See how much you could save.